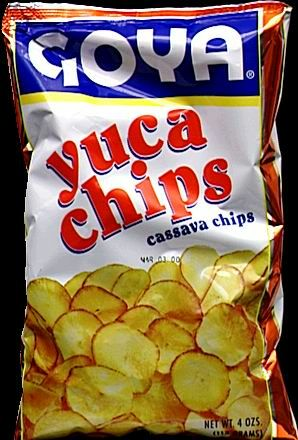 Goya Yucca Chips are a healthy way to snack. You can use them as a garnish, or as a side dish. Goya Yucca Chips are a perfect snack for your parties. Lightly Salted enjoy them at any time. If it is Goya, it has to be good! Ingredients: Cassavas, vegetable oil (corn oil and/or rice bran oil and/or cottonseed oil), and salt. Goya Cassava Yuca Chips son la forma saludable de botanear. Puedes usarlas como adorno o platillo acompanante.o bien usarlas en fiestas como botana en lugar de las papitas regulares. Ligeramente saliditas. Si es bueno, tiene que ser Goya! Ingredientes: Cassavas, aceite vegetal (aceite de maiz y/o aceite de arroz y/o aceite de semilla de algodon), y sal. In my Spanish classes we were learning about Equatorial Guinea and some of their eating habits. A common food there is yuca, or cassava. These chips I purchased helped transport us to Africa in a small but meaningful way. At first, students thought they tasted just like potato chips, but as they continued eating, they said they tasted like bananas and sweet potatoes.